There's been an intense push by immigrant groups this year to help people apply for citizenship because of Donald Trump. Lovos was eligible to become a citizen years ago, but he said he never got around to filling out the paperwork. "I wasn't very interested before in becoming a citizen because we weren't too worried about anything," Lovos said in Spanish outside a hotel in Washington D.C. where he works as a maintenance man. "But now there's all this rhetoric about deporting 11 million undocumented people." So on Christmas Day, he and his wife decided it was time to become citizens. "We want to help elect a good president for people in this country who don't have a voice or a vote," said Lovos. "I want to become a citizen to help other people, because other people have done it for me in the past. Citizens are the people who have power to make change." Lovos said the primary reason he's becoming a citizen now is so that he can vote in November against Trump. "I don't understand why [Trump] has to generalize. Candidates can't say all immigrants are bad or that we have to deport them all," said Lovos. There are an estimated 8.8 million people like Lovos in the country — legal permanent residents who are eligible to become citizens. And, in the months after Trump announced his bid for president, citizenship applications were up 14.5 percent compared to the year before, according to data from the United States Citizenship and Immigration Services. Of course, applications tend to spike in election years. And, from year-to-year applications also fluctuate because of other factors: possible fee increases or organized citizenship drives. This year, there's also been an intense push by immigrant groups because of Trump. A coalition called "Stand Up To Hate" has held held more than 300 workshops across the country in recent months. In March, they helped nearly 13,000 people with their citizenship applications. At one workshop in Miami, Mauricio Lotero, 42, sat in a college classroom listening to instructions from USCIS officers. Lotero says he came to the workshop because of presidential politics. "If Donald Trump is the president of the United States, maybe the immigrants or my citizenship will be affected in the future," he explained. Lotero says he wants to have a vote in the presidential election. "I don't want Donald Trump as president, so that's one of the reasons I want to vote, because I want to vote against Donald Trump," he said. It's hard to say for certain whether the spike in citizenship applications is a correlation or a causation. But, David Damore, a professor at the University of Nevada, Las Vegas and an analyst with the public opinion research group Latino Decisions, remembers a similar pattern in recent history. "We found this in California in some of the work I did with Latino Decisions on the effect of Proposition 187 in the early 1990s," said Damore, referring to the ballot initiative in California that sought to eliminate government services — including K-12 schooling — for people living in the state illegally. The measure passed, but it was never implemented. Still, in the years following the controversial vote, Damore said Latinos were mobilized in new ways. "You saw more participation, but you also saw more people who were eligible to naturalize, naturalizing," he said. And, data from USCIS confirm there were record numbers of citizenship applications in 1996 and 1997. "It's that threat that has been proven to be an important mobilizer among immigrants to get them to naturalize and eventually participate in the political process," Damore said. Citizenship applications are currently higher than normal. The Pew Research Center points out that "the number of legal permanent residents applying for U.S. citizenship in the four months starting last October is at its highest level in four years ... up 5 percent from the same period before the election." But, still the current surge in applications is a fraction of the growth seen in some previous years. In 2007, ahead of a proposed fee increase, roughly 1.4 million immigrants applied for citizenship. According to Pew, that 2007 bump was "an 89 percent increase over the previous year — the single largest annual increase since the government started tracking naturalization applications in 1907." So, it may be too soon to definitely say what's happening this presidential cycle. 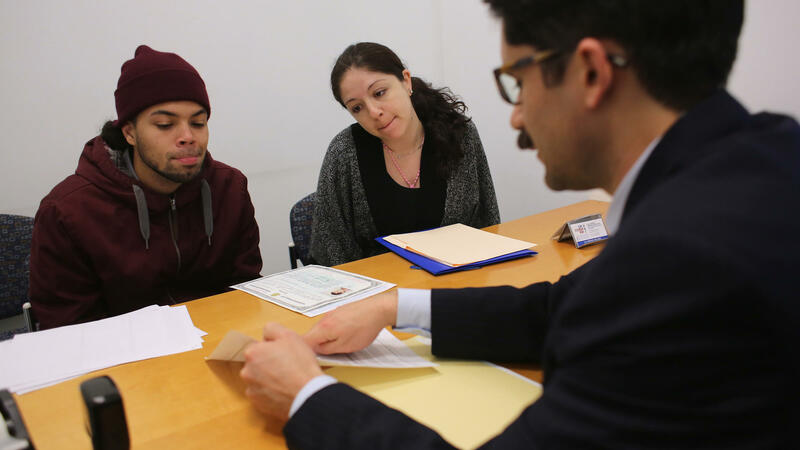 Anecdotal evidence from immigrant groups and attorneys suggest thousands of additional immigrants have applied for citizenship this Spring, but up-to-date citizenship data from USCIS is not yet available. Even if the current surge is nowhere near as high as the record years, activists point out that Latinos and Asians who become citizens are more likely to play an outsized role in the election because history shows they tend to vote at a higher rate than their counterparts who were born citizens.